Since 2003 we have successfully partnered with universities in southern Africa, specifically Lesotho and South Africa, to bring four faculty members to the LRSM every summer to participate in collaborative research projects with our associate faculty. 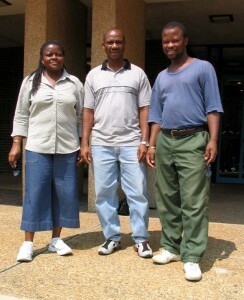 During the summer of 2003 four faculty members, three from the National University of Lesotho and one from the University of North West, South Africa, visited the MRSEC for a month. In summer 2004 three faculty members from the NUL spent two months at the LRSM undertaking collaborative research. The researchers and their projects were; Prof. Ben Maliehe, Physics, NUL who worked with Prof. Charles Kane, Physics on ‘The effect of electron interactions on the magnetic susceptibility of carbon nanotubes,’ Prof. Ncholu Manyala, Physics, NUL, who worked with Prof. Charlie Johnson, Physics on ‘Electron transport and phonon spectrum in hybrid nanoscopic “peapods”, and Prof. Mantoa Sekota, Chemistry, NUL who worked with Prof. Donald Berry, Chemistry, on ‘New polymerization catalysts for control of helical domains in opto-electronic polymers.’ Since 2003, the following faculty from Southern Africa have participated in this program. Mantoa Sekota, NUL* Berry/Therien/Schelter, Chem. Sejakhosi Mohale, NUL Jason Burdick, Bioeng. Video conference to Philadelphia classrooms via cable TV. This presentation given by Professor Dennis Discher – “Blood Cells, Biological and Artificial”. In conjunction with the Philadelphia School District, we can now link the SEFs with school classrooms in real time using a recently purchased V-Tel teleconferencing unit and the School District’s cable TV network. By analyzing the products of classroom experiments using our sophisticated instrumentation, and allowing students to have partial control of these instruments, an increased awareness will be generated of the advanced technologies that can be brought to bear on scientific problems. In addition, this interaction will enable the students to appreciate the research being carried out by scientists and engineers. This program is open to grades 7-12 and covers experiments in chemistry, physics, earth sciences, biological sciences, and environmental science. The first program, demonstrating the use of scanning electron microscopy was broadcast on November 5, 1998. Multiple broadcasts have since been made to Pennsylvania schools and to Philadelphia schools through the cable network and more recently by broadcasting from the school district’s t.v. studio. Since 1994, the LRSM has presented a monthly series of materials-based lectures to science teachers during the school year. These were given by faculty and staff associated with the LRSM. The lectures were free, took place on Thursday evenings at 5:30 pm, and were followed by food and refreshments during which teachers could engage the speaker in conversation about the talk or other aspects of education. We recently decided to conflate this lecture series with our Science Cafe series in Philadelphia, which are now held on the same day, Thursday, and at approximately the same time, 6:00 pm. These lectures have similar content. For further information go to our Science Cafes page. Prof. Gorte lecturing to teachers about ceramics. The 14 students participating in CIRE research. 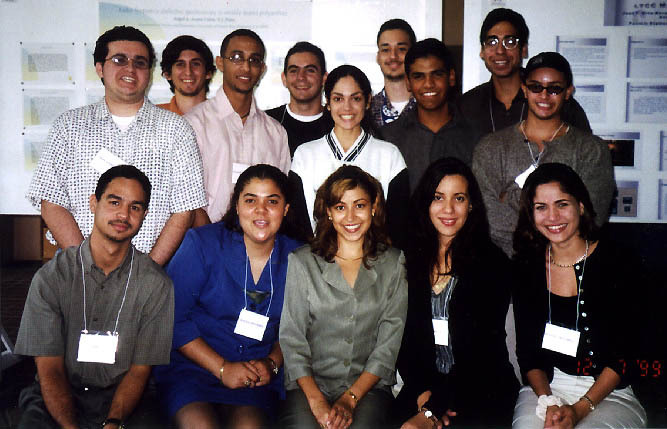 Taken during the NSF site visit to Humacao, PR, December, 1999. Prof. MacDiarmid talking to high school students after his lecture. 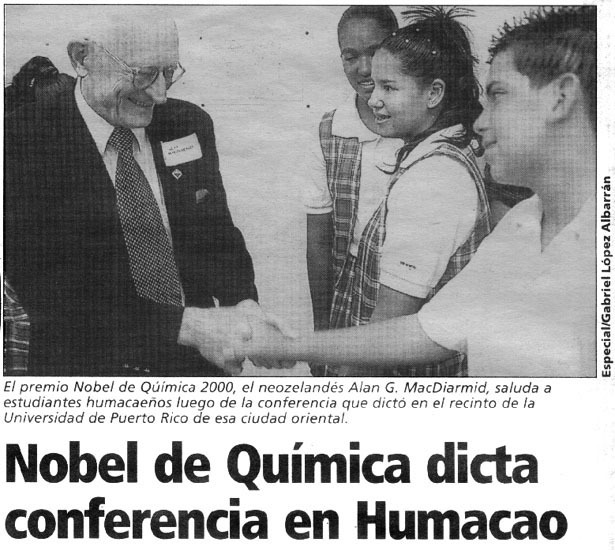 Prof. MacDiarmid with local high school teachers from Humacao who each brought 15 students to his lecture. 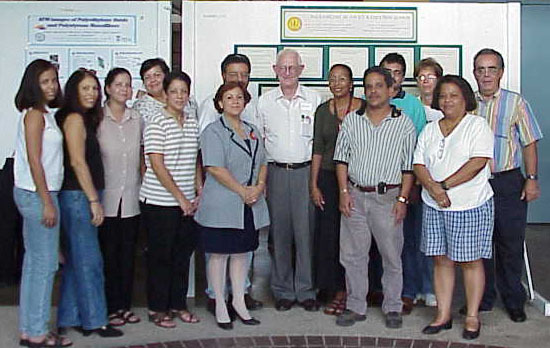 The annual CIRE meeting between PENN faculty and UPR faculty and students was held at the Humacao University College, UPR on Oct.30/31, 2000. 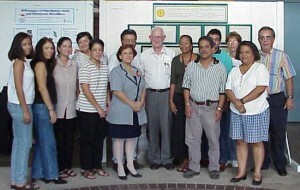 Participants from UPR included Profs. Gabriel Barletta and Margarita Ortiz, Chemistry, Profs. Idalia Ramos, Nicholas Pinto and Claudio Guerra, Physics, and Prof. 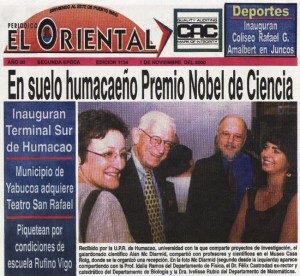 Lesser Blum, Physics, Rio Piedras, and their students. PENN participants included Profs. Charlie Johnson, Physics, Jorge Santiago, EE, Alan MacDiarmid and Andrew Rappe, Chemistry and Andrew McGhie, LRSM. This was the first meeting attended by Alan MacDiarmid since winning the Nobel Prize in Chemistry earlier in the month and was marked by a banquet in his honor given by the University Chancellor, Prof. Roberto Marrero. The meeting concluded with a special lecture given by Prof. MacDiarmid to 300-400 undergraduates and high school students who crowded the University’s recently renovated UPRH Theater. 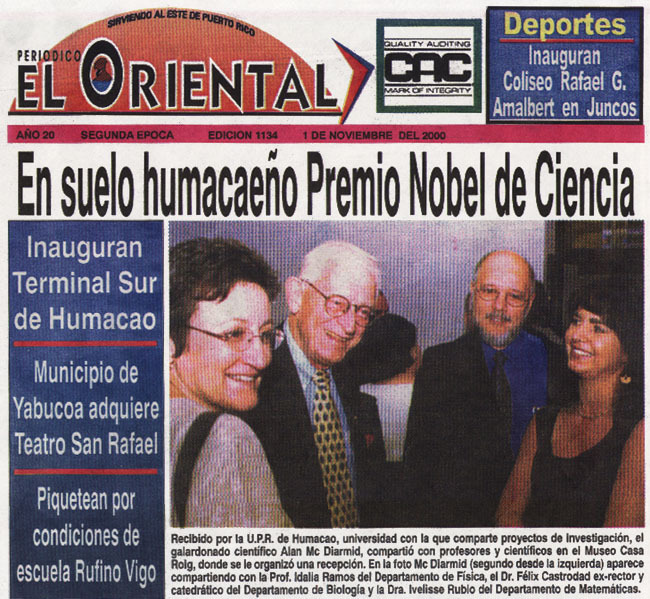 Headlines in newspaper covering eastern Puerto Rico. front row, Jason Kressel, Scott Heinz, Amy Drakeman, middle row, Joanne Cohen, Nathan Venskytis, Andy Wen, Mike Lin, Will Andress, Eric Baker, back row, Mike Sheehan, Matt Ligon, Kent Lau, Chris Low, and Sean Bard. The LRSM, in conjunction with the Pennsylvania Summer Science Academy, (PSSA), organized by the College of General Studies at Penn, had instituted a 4-week long summer course in Materials Science for up to 24 high school science students. Courses offered by PSSA included Molecular Biology, Environmental Science, and Mathematical Science. 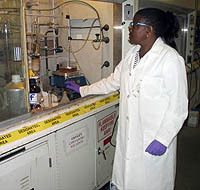 The Materials Science option started in 1996 with 23 students and included a daily lecture, computer instruction, discussion groups, week-long laboratory experiments in the LRSM’s Shared Experimental Facilities, and visits to both industrial and Penn laboratories. Most students lived on campus and were drawn from a national applicant pool. After the course the students rated the laboratory course at 9.9/10, the highest rating ever achieved in the PSSA program, and the instruction at 8.4/10.